Today’s leading suppliers of power generation and energy delivery products require cutting edge technology and superior performance to meet the world’s most demanding energy requirements. Gas turbine systems are primarily used in auxiliary electric power generation to manage peak loading conditions or for emergency power generation. Using gas turbines, power utility companies as well as various other industrial companies, can reduce their dependency on costly primary sources of power since these generators can be located anywhere and used as power needs fluctuate. In simplistic terms, a gas turbine produces power by compressing air mixed with burning fuel that is expanded through spinning turbine blades to drive a generator and convert the spinning energy into electricity. Gas turbines range in size from very small units to larger combined cycle generators capable of generating up to 300 MW of power by utilizing advanced materials and technologies. In order to produce such high power levels, much higher turbine inlet temperatures and corresponding cooling systems are required. As a result, sophisticated data acquisition systems are needed in order to ensure the behavior of the turbine at such extreme temperatures. Testing is a critical aspect of gas turbine manufacturing. 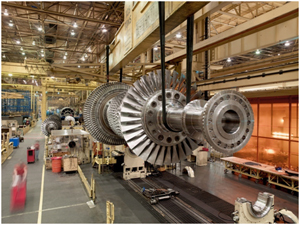 Typical tests involve recording, measuring and analyzing the physical characteristics associated with gas turbines to ensure their reliability and efficiency. The most common measurements taken are temperature (inlet/outlet gas), pressures, loads, and torque. High-performance test instrumentation is required during research & development to improve the efficiency of new designs as well as ensure the reduction of undesirable gas emissions and during production or startup testing at the time of installation to verify proper setup and ensure reliability.